Addresses the problem of team failure with solutions aimed at developing & integrating the emotional & social intelligence of participants. - Publisher What are today's teams really like, and why are they failing? In their new book, authors Harvey Robbins and Michael Finley explain what they see as the reason: teams fail largely because they don't think through the human implications of teaming. The New Why Teams Don't Work is as much about people as it is about business. This handbook will help team members and leaders maintain the highest level of social and emotional intelligence by making them more aware of their own needs, conflicts, and peculiarities. Among the new chapters are "Collaboration vs. Teamwork," "Team Balance," "The Death of Teamwork," "The Team of One," and "Teams at the Top." 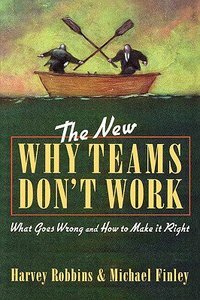 About "The New Why Teams Don't Work"
What are today's teams really like, and why are they failing? In their new book, authors Harvey Robbins and Michael Finley explain what they see as the reason: teams fail largely because they don't think through the human implications of teaming. A practicing psychologist, business consultant, trainer, and author specializing in teams and organizational behavior with clients. MICHAEL FINLEY is a business columnist for the "St. Paul Pioneer Press" and Knight-Ridder newspapers.